By Simon Dumenco . Published on March 21, 2019. Welcome to the latest edition of Ad Age Publisher's Brief, our new roundup of news from the world of content producers across digital and print. Got a tip? Send it our way. Joining us late? Here's the previous edition. Digital First Media took a step forward in its hostile bid for Gannett Co., with a debt specialist indicating Digital First could raise the funds needed to pay for the $1.4 billion takeover. Oaktree Capital Management LP, a credit-investment firm with $120 billion of assets as of December, told Digital First it is "highly confident" in Digital First's ability to attain a debt financing package of at least $1.725 billion in connection with the offer for the USA Today publisher, according to people familiar with the matter. Digital First, officially known as MNG Enterprises Inc., offered to buy Gannett in January for $12 a share. Gannett isn't particularly happy about what it has characterized as a lowball offer, and it's expressed doubt that Digital First could raise the needed cash—but as Lombardo and Alpert note, "a vote of confidence by an established firm such as Oaktree" basically neutralizes Gannett's argument. Digital next: Last July Troy Young was named president of Hearst Magazines—he'd previously been president of Hearst Magazines Digital Media—and under his leadership the company's glossy brands continue to crank up their digital expressions. The latest sign of that transition is the elevation of Katie Connor, deputy editor of Elle, to digital director of Elle.com. Starting April 8, Connor will be overseeing original editorial content, social media and video production for the site, which reaches more than 14 million monthly uniques. Exit strategy: WWD's Samantha Conti reports this morning that "Gillian de Bono is leaving her post as editor of How to Spend It, the Financial Times' luxury magazine supplement, to pursue new projects in journalism and beyond." She's been with the FT since 1994 and Conti notes that she "built How to Spend It into a luxury-industry force. ... On de Bono's watch, How to Spend It rapidly become a template for the myriad glossy fashion and lifestyle supplements that come with the weekend newspapers, as well as a lucrative revenue stream for the paper." The FT has not yet named her successor. Per CBS News last night: "Hope Hicks and AMI agree to turn over documents for House probe into Trump." Hicks, of course, is the former White House communications director. And AMI is American Media Inc., the parent company of the National Enquirer. CBS News' Rebecca Kaplan reports that the publisher has "agreed to turn over documents to the House Judiciary Committee, a spokesperson confirmed. AMI was part of a 'catch and kill' scheme during the 2016 campaign to pay off women who said they had affairs with [then-candidate Donald] Trump." 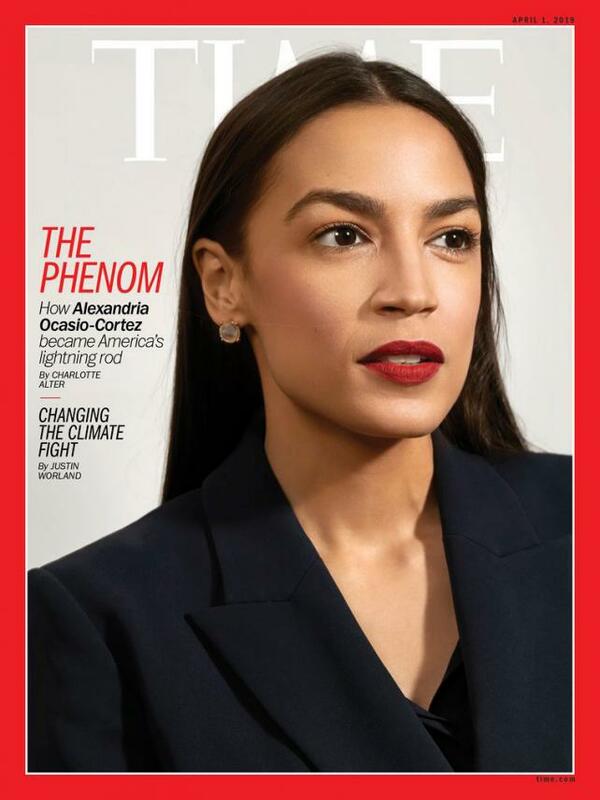 Wonder Woman of the left, Wicked Witch of the right, Ocasio-Cortez has become the second most talked-about politician in America, after the President of the United States. Since beating 10-term incumbent Joe Crowley in the Democratic primary to represent New York's 14th District last June, the 29-year-old former bartender has pressured 2020 presidential candidates into supporting her Green New Deal, made campaign-finance reform go viral and helped activists banish Amazon from Queens with a couple of tweets. No lawmaker in recent memory has translated so few votes into so much political and social capital so quickly. Her Twitter following has climbed from about 49,000 last summer to more than 3.5 million. Thousands of people tune in to watch her make black-bean soup or re-pot her houseplants on Instagram Live. Immediately after she tweeted the name of her signature red lipstick—Beso, by Stila—it sold out online.